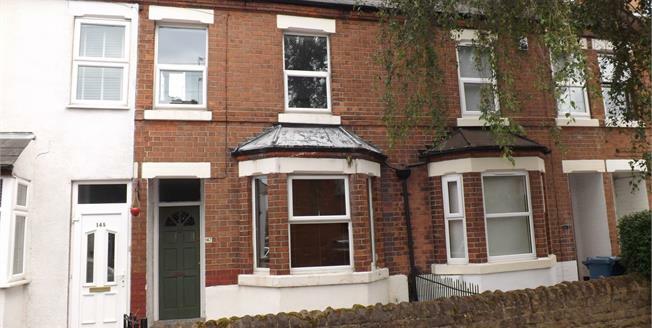 A well presented two bedroom Victorian house in central West Bridgford. In brief the accommodation comprises entrance hall, lounge, dining room, kitchen. To the first floor there are two double bedrooms and a large bathroom. Garden. Gas heating. UPVC double glazed. Bay window to the front elevation, radiator, original floorboards, coal effect gas fire with decorative surround. Window to the rear elevation, radiators, original floorboards. Window to the side elevation, door to the side access. One and a half bowl sink unit with drainer, range oven, free standing units with baskets, walk in pantry. Two windows to the front elevation, radiator, original floorboards. Window to the side elevation, heated towel rail. Low level WC, panelled bath with shower over, pedestal sink. The rear garden is mainly laid to lawn. Outhouse with plumbing for washing machine.